Banksy has described his latest work, the Walled Off Hotel in Bethlehem, as “a three-storey cure for fanaticism, with limited car parking.” It's a typically glib statement from the bingo master of heavy-handed symbolism, the latest evolution in a career of unsophisticated protest art, the tipping point where he jumped the shark from aggressive mediocrity to ludicrous pompousness. Located on the West Bank, the hotel is face to face with the eight-metres-high security barrier built in 2002 to separate Israel from Palestinian territories, and which was found to be a violation of international law by the International Court of Justice in 2004. Banksy's GCSE-level protest art was banal but tolerable when dealing with CCTV or kissing policemen, staging mock-guerrilla gallery takeovers, or creating Disneyland parodies. It is, however, horrendously unequipped to deal with the terrible realities of the West Bank. The superficiality and logical inconsistencies of his artistic output are glaringly obvious when the latter is applied to deep and complex political situations like the Israeli-Palestinian conflict. What’s more, the hotel project highlights the artist’s self-importance in thinking that his pop-culture mash-ups would be appropriate in a warzone. 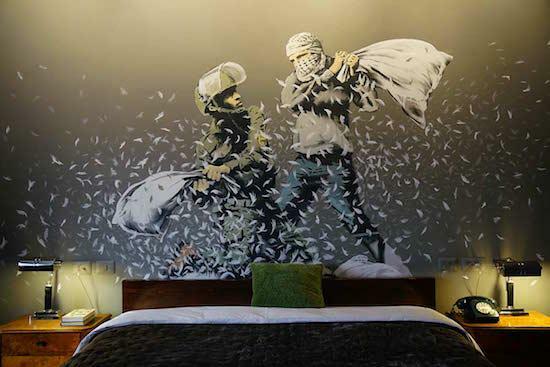 Through the artworks in the hotel, Banksy reduces the highly charged situation to protest-art-by-numbers: motifs used in the hotel’s work include barbed wire (tick), bullets (tick), soldiers (tick) for war, and children (tick), balloons (tick), flowers (tick), and classical art (tick) for peace. This type of obvious symbolism makes sense for the fly-by-night, graphic nature of graffiti, in which the artist has to create maximum visual impact before the authorities catch them. It works less well within the gallery context, where there’s time and space for silent contemplation. Symbolism only works when used sparingly. If you keep using symbols where no meaning is intended, two things happen: the viewer reads into things that were never meant to be read, and the messages you did want the viewer to pick up on are obscured amongst the dross. There is an argument that Banksy might be doing this deliberately, that he is an agent of the postmodern. But it would be giving Banksy too much credit to see him as actively working to dismantle meaning, mainly because he claims a position as a protest artist: his works must have meaning for them to be worth anything at all. A classic Banksy move is to borrow snippets from the news and insert inanities into them in an attempt at subversion. This approach can be seen in a mural of an Israeli soldier and Palestinian citizen pillow fighting, painted above one of the hotel beds. It’s a rehash of his more famous Kissing Coppers (2004) which is, no doubt, inspired by My God, Help Me To Survive This Deadly Love (1990), the legendary painting on the Berlin Wall by graffiti artist Dmitri Vrubel. Vrubel’s image works because it is a decontextualisation of an existing photo, with no additions except the text of the title. 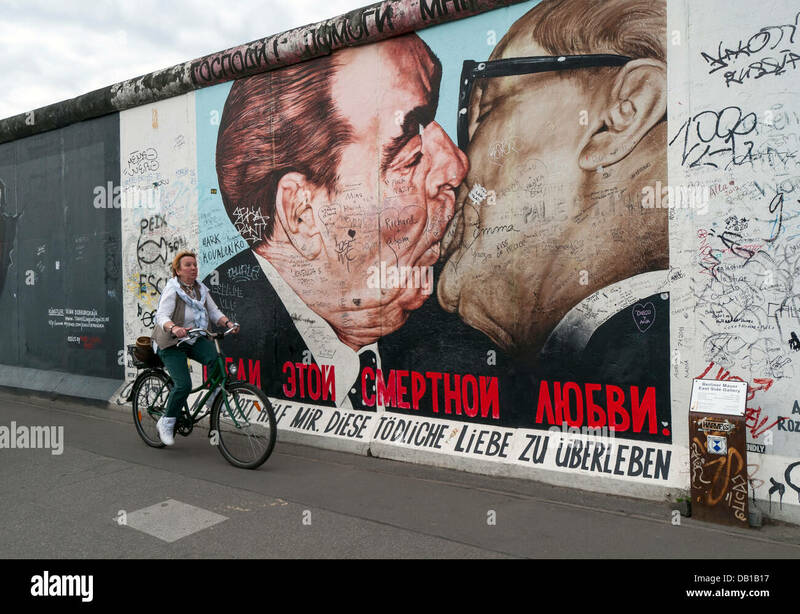 The photo itself is the provocative image, an expression of socialist fraternal love between Leonid Brezhnev and Erich Honecker that takes on its grotesque and ironic aspect when appearing on the physical symbol of social and political divide. Whereas with the soldier-civilian hotel mural, one imagines the complacent thought process: a balaclava-clad figure stroking his chin, saying to himself “Israel and Palestine are fighting! But what if we changed fighting to … pillow fighting?” You can almost hear the self-congratulatory back slapping. Not only is the mural itself distasteful, but it shows the inadequacy of Banksy’s rubric. What does the image even mean? We know Israel and Palestine are fighting. What is the point of trying to subvert that? Trying to destabilise a commonly-held assumption or stereotype is one thing, but trying to destabilise a fact is another. Banksy’s blunt protest tools don’t discriminate between social constructs and actual truth; if everything is fair game to his destabilising tactics, what is the use of him protesting at all? If he is trying to bring awareness to the conflict through this art, he has failed spectacularly. He has managed to destabilise the idea that the Israeli-Palestinian conflict is real - something the survivors of bomb attacks and military arrests would find frankly insulting - while also highlighting his inability to tell the difference between what to protest and what to leave well alone. Indeed, while the western media has been falling over itself to praise the installation, many Palestinian groups have raised serious concerns. The Guardian's positivity about Banksy's hotel is the kind of uncritical approach that has allowed him to get this far, celebrating his "angry brilliance" and "playful" works, when for West Bank residents, war is not a joke or something with which to be played. Their line "he wants guests to leave with more than just a selfie" subconsciously underscores the sheer superficiality of the hotel, while highlighting the way Banksy’s works have become badges of proof of worthiness, ripe for sharing on social media. The hotel is decorated in a pastiche of British colonial style, with tropical wallpaper and a bamboo bar, CCTV cameras mounted like hunting trophies, a metaphor better when written down than when visually enacted. There's also a diorama of British foreign secretary Arthur Balfour in 1917 signing the Balfour Declaration - the letter that declared British government support for the creation of a Jewish state and paved the way for British involvement in Palestine for decades to come. Banksy said in his statement: “I don’t know why, but it felt like a good time to reflect on what happens when the United Kingdom makes a huge political decision without fully comprehending the consequences.” Putting the cloying feigned ignorance of Brexit to one side, it seems a warning against foreign involvement in international affairs is one of Banksy’s most serious purposes here. It's a shame he does this with tawdry, cheap museum props, again making it look as if he’s trying to destabilise historical fact by so clearly using artifice to depict it. It's similarly unfortunate that he seems unaware of the irony of a Briton wading into an international conflict critiquing a Briton who waded into an international conflict. For an artist whose career has been founded on the idea of opening people’s eyes to serious issues, he is spectacularly blind to his own logical inconsistencies. At best, the hotel is a well-intended but poorly thought-through attempt to help alleviate suffering. At worst it's an arrogant Brit drunk on the heady potion of faux-cool, thinking his hot takes on politics eg. "war bad, peace good" might alleviate the world's most intractable conflict. Establishing a boutique hotel in a region torn apart by bloodshed for the express purposes of encouraging tourism to a war zone - i.e. making a spectacle out of West Bank residents’ suffering - smacks of moral bankruptcy. He's no spray-can wielding Robin Hood. Banksy's protest dilettantism used to be irritating but ultimately harmless, the equivalent of sharing a popular Change.org petition on Facebook and feeling like you’re a better person for that tiny effort. This hotel in Bethlehem tips Banksy's superficial protest works over the line into actually causing damage. It risks trivialising the horrific experiences of the people affected by the situation, and normalising it by putting it into a gallery context and using it as a business platform. It risks turning the Israeli-Palestinian conflict into a cliché; a dismal outlook indeed for the battle-scarred citizens of the West Bank, who need security and practical solutions towards peace rather than having their trauma being plundered for the inspiration behind weak artworks. The bluntness of Banksy's tools undermines his ability to make a difference. Banksy has taken the artistic power of using something unexpected and taken it far beyond its logical extreme, irrevocably corrupting it. His entire career has been made on his hack tactic of mashing together, the images he produces ultimately meaningless through the lack of ideological weight. All that Banksy makes you think is that he really doesn’t have a clue what he’s doing.